Some Teachers collect Musical Figurines. I collect Flyswatters…and Turtles! The Dollar Store is a great place to find fun Flyswatters (and Turtles…LOL). This Flyswatter came all the way from Nashville - Music City itself. Did you know that Flashcards and Flyswatters can provide you with the tools to build a solid foundation in Theory AND in Ear Training? Each of our Ultimate Music Theory Workbooks has 80 Free Flashcards to match the accompanying Workbook level including Prep 1, Prep 2, Basic, Intermediate, Advanced and the Complete Rudiments Workbook. When they get their Workbook, Students should put their Flashcards in a Ziploc bag. The Ultimate Tote Bag has a zippered pouch at the front - perfect for holding Flashcards! Each set of Flashcards contains several “Rhythm” Flashcards. For our “Slap that Rhythm” game, collect the Rhythm Flashcards from your students set of Flashcards. Spread the Flashcards out on a table or on the floor. 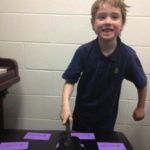 For a Kinesthetic Learner, spreading them out on the piano bench so that the Student can stand behind the bench will provide them with a positive learning environment – one wherein it is okay to move! The directions for this game are super easy! 1) The Teacher claps the rhythm from one of the Flashcards. 2) The Student slaps the correct rhythm. Is your Student ready? Are YOU ready? Slap That Rhythm - Is it Simple or Compound Time? Study your Rhythm Concepts in the Intermediate Rudiments Workbook and play Slap That Rhythm. 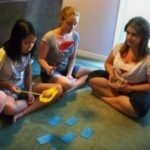 When playing Intermediate Slap That Rhythm, whether in group or private lessons, Students reinforce how easy it is to quickly identify the difference between Simple and Compound Time. Is the Basic Beat a dot or no dot? If the Student does not slap the correct rhythm, ask them to clap the rhythm that they slapped and then you clap the rhythm that they should have clapped. Be certain to feel the pulse – clap louder (stronger) on the first beat of each measure. This will support the Auditory Learner to hear and feel the first beat of the measure. Discussing what was similar and what was different about the rhythms will support the Visual Learner to connect what they are seeing with what they are hearing. For Special Needs Students, start with two Flashcards. 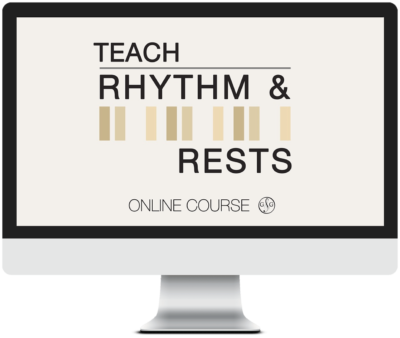 First have the Student clap each of the two rhythms so that they see, hear and feel each rhythmic pattern. Then you clap ONE of the rhythms. As the Special Needs Learner develops confidence, add additional Flashcards one at a time. “Slap that Rhythm” also prepares students for Ear Training Components on their Practical Examination. 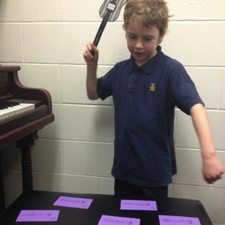 Even if your Student is not preparing for a Practical Examination, playing “Slap that Rhythm” will develop and strengthen their rhythm and counting skills. And if you are ever in a Dollar Store and they have a Turtle Flyswatter, please let me know! P.S. - Join the Conversation! Play "Slap That Rhythm" with your Students and share your experience with us!